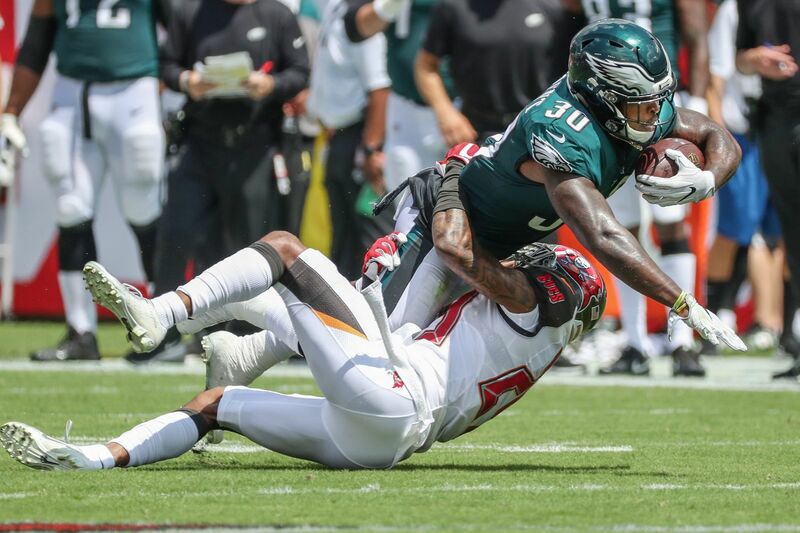 Corey Clement is tackled by Tampa Bay's Ryan Smith in the second quarter of the Eagles' loss on Sunday. The Eagles lost to the Bucs, 27-21, on Sunday in Tampa. Read more about the game here. DOWN – The game got off to a portentous start when Jenkins bit the cheese on a Ryan Fitzpatrick pump and DeSean Jackson burned the Eagles over the top with a 75-yard touchdown grab. The day wasn't all bad for the Eagles safety. He later forced a fumble. But that opening-play mistake was hard to overcome. DOWN – The Eagles cornerback needed inside safety help on Jackson's big play, but he was picked on unmercifully by Fitzpatrick and receiver Mike Evans. Mills is a battler and will likely bounce back, but this was a game to forget. SIDEWAYS – Foles' numbers were more than adequate. He completed 73 percent of his passes for 334 yards and a touchdown and didn't toss an interception. His fumble could have easily been called a forward pass as well. But the backup quarterback was a tick off on several tosses and just didn't get the job done. DOWN – The Eagles coach's gambles have paid off far more than they haven't. The fourth-and-4 call early in the second half was questionable because of the timing and because the defense had been unable to stop the Bucs. But it wasn't Pederson's worst decision. That honor goes to the third-and-11 draw to Wendell Smallwood with over three minutes left before the break. UP – The Eagles running back deserves to be featured more in the offense, whether Darren Sproles and Jay Ajayi are healthy or not. Clement scored the Eagles' first touchdown with a 15-yard rumble and caught five passes for 55 yards. SIDEWAYS – The tight end led the Eagles with 11 catches for 94 yards. He did a bunch of Zach Ertz things and helped keep his team in the game. But it would have been nice to see him covert that fourth down — despite a dubious spot by the officials. DOWN – Fitzpatrick had far too much time to throw. Fletcher Cox recorded a sack and was a consistent force inside, but Brandon Graham, Derek Barnett, Michael Bennett and Chris Long combined for zero sacks and only four quarterback hits. DOWN – Mike Wallace left early with an ankle injury and the Eagles were down to Agholor (eight catches for 88 yards and a touchdown) and a bunch of guys. No offense to Kamar Aiken, Shelton Gibson and DeAndre Carter, but they just aren't reliable enough. SIDEWAYS – Darby's coverage was solid for the most part. He gave up a few catches, but he also broke up a pass and notched an interception (thanks to Rodney McLeod's deflection). But his tackle attempt on O.J. Howard's 75-yard touchdown was egregious. UP – The sins of Chip Kelly are still having repercussions. Who knows if DeSean Jackson would still be in Philly? But the receiver has saved some of his best performances for the Eagles and now has 24 catches for 569 yards (23.7 average) and three touchdowns in six games vs. his old team. DOWN – A field goal before the half would have trimmed the Bucs' lead to 11 points, but Elliott bonked a 42-yard attempt off the right upright. UP – The Eagles' MVP for the game, Johnston's booming kicks helped the defense with field position in the first half. The punter finished with a 46.2-yard net and landed three tries inside the 20.